An earthquake measuring 6 on the Richter scale tonight shook the West Coast of Great Nicobar Island just four hours after one which hit the coast this evening. The quake occurred at the latitude of 6.5 degree in north and longitude of 91.9 degree east, the Indian Meterological Department said and described it as a moderate one. Should doctors guilty of female foeticide be given exemplary punishment? The Indian Navy and the Army have been pressed into service for relief operations in the tsunami-affected areas of Tamil Nadu while the administration, as a preventive measure against the outbreak of the epidemic, conducted mass immunisation programmes among the victims. 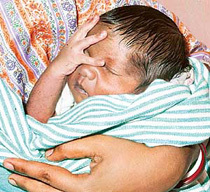 Six-day-old Tsunami Roy, sleeps in his mother’s arms at a relief camp at Port Blair on Saturday. Tsunami was born three weeks ahead of time on a rocky slope where his parents had fled from the killer waves that lashed Hut Bay on the remote Little Andaman Island on December 26. 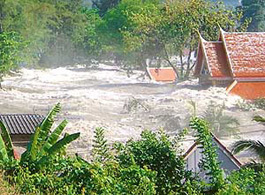 The confirmed number killed in the massive earthquake and tidal waves that hit Indian Ocean shorelines a week ago passed 1,27,000 today, as more bodies were recovered in Sri Lanka. Q: Does people-to-people contact between India and Pakistan help the peace process? The Justice Nanavati Commission, which is inquiring into the 1984 riots and preparing to submit its report to the Union Home Ministry, sees a ‘pattern’ behind the attacks on Sikhs. “The evidence does indicate a pattern in which the riots took place and the pattern in which the attacks took place on the Sikhs,” Justice G.T. Nanavati said. The Centre has delegated powers to the Gujarat Government to grant citizenship to nearly 900 migrants from Pakistan who have been residing in four districts of the state for the past several years. After a brief respite, chill was back in North India with mercury dipping in most parts, including the national capital, and frigid conditions prevailing in Jammu and Kashmir and Himachal Pradesh after fresh snowfalls. Two persons were killed when a Food Corporation of India (FCI) truck was crushed under a landslide triggered by rain and snowfall on the Jammu-Srinagar National Highway today.